Whether your child with autism is on the mild or severe end of the autism spectrum, many ordinary childhood activities can be challenging. It can be hard to work around sensory issues, social and communication challenges, and a preference for repetition and routine. The result of these challenges, unhappily, is that many families with autistic members avoid trying new things with their autistic family members. But the fact that people on the spectrum may not actively ask for company or explore new possibilities on their own is not a reason to give up; instead, it's an opportunity to find the best way to reach out and learn with and from an autistic family member. There are many ways for people with autism and their family members to enjoy hobbies and activities together. In some cases, accommodations are needed, but in many cases, autism is either no issue or is actually an advantage. The key to success, however, is to choose an activity and a venue that is comfortable for and interesting to your autistic child. To choose an appropriate activity, start by observing your child's play and, if he is verbal, ask questions. What does your autistic family member enjoy? How does he or she choose to share interests with you? Next, try joining in your child's activity. 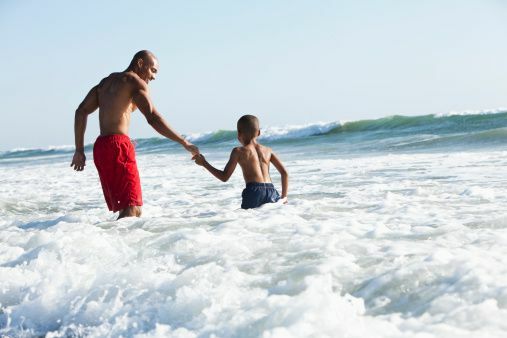 Rather than leaping in with your own ideas and direction, however, try following your child's lead. Many of us have been taught that there's a "right" and "wrong" way to play a game or build a structure, and we want our child to "do it right." But when you're working with an autistic child, the first and most important step is engagement and communication, not instruction. Think about ways to expand on your child's interest. How can you take an interactive role in her favorite pastimes? How can you expand on her interests and help her to explore the world? If she likes watching Sesame Street, might she also enjoy a puppet show? If he loves collecting baseball cards, would he enjoy watching a game on TV or in the real world? Take it a step at a time. Your autistic son loves baseball cards, and that's a great interest to share. But that doesn't necessarily mean he'll love a full day outing to a major league game. Start slow, perhaps by watching a single inning at a high school game. If there are challenges (heat, bugs, boredom, behaviors that disturb other fans) think about ways to work around them to to help your child to cope. Have fun! Remember the whole point of enjoying activities together is to have fun and build connections. If the experience is stressful for either or both of you, it's time to back off a bit and find a way to make it fun. These are some of the most popular activities shared by autistic children and their families. Of course you and your child may have completely different interests, but these ideas should start your creative juices flowing. As you read through this list, you may think "my child isn't able to comprehend or participate in any of these activities; he can't even speak." While that may be true in some cases, the ability to speak, sit still, or otherwise "behave normally" are not required for most of these activities. Many nonverbal autistic children are accomplished gamers, artists, swimmers, runners, and more. Video Gaming. As most of us know, video games are not just for kids, and they come in many levels of difficulty and complexity. Your autistic child may enjoy playing Minecraft or Lego Harry Potter all alone, but that doesn't mean you can't join in and take part in the fun. Instead of assuming you're not wanted (or that the games are too hard for you!) take some time to learn the ropes, ask questions, and get involved. If your child is just starting out or has a hard time with complex games, there's nothing wrong with playing very simple games. In fact, you might even want to break out the "classic" 1980's "shoot the bad guys" games, as they are simple, easy, and involve just two buttons! Legos. Who knew that a bunch of plastic building bricks could turn into a full-scale, international artistic and scientific medium? If your child with autism is a Lego fan (and many are) your options are endless. Build from blueprints and diagrams. Create your own cities. Watch the Lego movie. Go to Lego conventions. Get involved with Lego Mindstorms, and then join clubs and compete. Go to Lego art shows. The possibilities are amazing. Trains. If you're an American, you may think it's weird to memorize train numbers, schedules, and specs. In Britain, however, train spotting is a time-honored activity. Join your child in learning about trains. Explore train museums where real trains (not surprisingly) look exactly like those in the Thomas the Tank Engine TV show. Watch train-related videos. Read train-related books. Build model trains. Visit model layouts. Join a modeling club together. Anime. A surprisingly large number of people on the spectrum love anime—a complex and much-beloved form of Japanese animation. Anime is huge, and it's everywhere. Join your child in watching, reading, and drawing anime. Create your own anime on the computer. Go (in costume) to an anime con. Most schools and communities even have anime clubs you can join. SF/Fantasy. Science fiction and fantasy are often of great interest to people with autism. Depending on their interest levels and abilities, people on the spectrum may learn every detail of a particular "universe," write their own stories, watch and rewatch movies, read comics, attend cons, or even build their own costumes. There is a whole world of opportunity for hobbyists out there, at all levels. Find your inner caped crusader, and get involved! Swimming. Whether at the ocean, in a lake, at a pool, or under the sprinkler, water activities are fun for almost everyone. And while some people do learn strokes, join swim teams, or become lap swimmer, many just ... go and have a good time together. Hiking and walking. People with autism are rarely good at team sports, but many have a lot of physical energy and stamina. If your child with autism falls into this category, consider getting into hiking and walking. In some areas, hiking means climbing a nearby mountain; in other areas, it means walking down the street. Either way, it's a great opportunity to get exercise and spend time together. You might also want to bring along a pair of binoculars to do some bird watching, train spotting, or star gazing—and think about building yet another shared interest. "Making." Many people with autism are very good at taking apart and building devices ranging from alarm clocks to small engines. This skill is highly prized within the "Maker" community. This growing community involves community members in coming up with, creating, and sharing prototype devices that do everything from lifting and moving to teaching and learning. Your child may be only a beginner maker, but his or her skills can be a good way to get started. Puzzle Solving. Many people with autism, even those who are non-verbal, have a tremendous knack for solving jigsaws and similar puzzles. This is a popular hobby—and one you can share in your home alone, with a group of friends, or even in a club setting. Animal Care. Not everyone on the spectrum loves animals, but those who have an interest are very interested indeed! Consider sharing that interest through activities that can range from horseback riding to pet care, volunteering at nature centers, fostering kittens or puppies, joining 4-H, or working at a local farm.